With 14 different patents and technologies used, covering ankle stability, air conditioning and protection, X-Socks Effektor Competition Running Socks are made to deliver race energy, but without neglecting the importance of maintaining skin and muscle health. 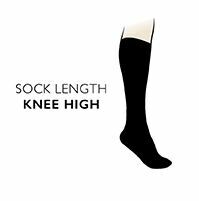 These high compression (ankle 21mmHg, calf 15mmHg) socks improve oxygen uptake for your muscles, reduce muscle vibration and improve recovery. Smart compression zones, and the PartialKompression system developed by this Swiss sports clothing specialist uses all the recognised advantages of compression, but without neglecting any cooling features, using AirConditioning channels throughout to prevent overheating during long competitions. To remove doubt, X-Socks Effektor Competition Running Socks have ‘positioning lines’ that ensure the socks are perfectly placed on the leg for maximum benefits. This means that every protective pad, every bit of compression is optimised. X-Socks Effektor Competition Running Socks are even anatomically shaped, with a left/right fit footbed and incorporate bacteria-limiting Skin-NODOR, protective hollow core Robur and breathable, anti-allergenic Mythlan fibres.